Evansville Tax Preparation: How Did It Go Last Year? The 2016 tax rush is now behind us. As with any process, it’s always helpful to reflect on how things went and determine if there are opportunities for improvement in the future. 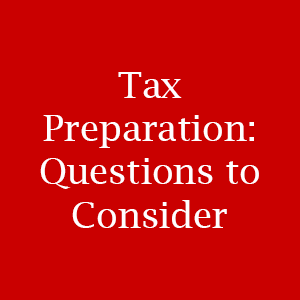 In this post, we’ll offer a few questions to ask yourself when determining how your tax filing process went. We’ll also share a few questions you should ask yourself if you’re considering making the switch to a different Evansville tax preparation company. Did I receive adequate explanation of my refund or liability? Was my filing completed by the deadline? Did my accountant help me identify any new deductions or credits that I was previously unaware of? Was it easy to communicate with my accountant? Did my accountant help me feel confident that my filings were accurate? Did my accountant stand behind his work? Did I underpay or overpay by a large amount? Were there unexpected or extra filing charges? Was the return price explained and substantiated? Did I notice an error in my accountant’s work? Should I stay with my current accountant? If I’m considering a switch to a new CPA, what criteria should I look for? Searching for a new accountant in the Evansville area? Reach out to the tax professionals at Baker Retirement & Wealth Management, PC. Our team has been preparing taxes in the greater Evansville area for nearly thirty years. We assist both individuals and businesses with taxes, accounting services, and other financial matters. Feel free to drop by any of our convenient office locations in Evansville, Newburgh, Owensville, or Boonville. You can also contact us by calling toll free at 1-866-244-3517.